Debris flow simulations are useful for predicting the sediment supplied to watersheds from upstream areas. However, the topographic conditions upstream are more complicated than those downstream and the relationship between the topographic conditions and debris flow initiation is not well understood. 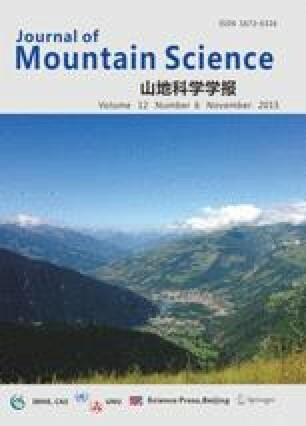 This study compared the use of several entrainment rate equations in numerical simulations of debris flows to examine the effect of topographic conditions on the flow. One-dimensional numerical simulations were performed based on the shallow water equations and three entrainment rate equations were tested. These entrainment rate equations were based on the same idea that erosion and the deposition of debris flows occur via the difference between the equilibrium and current conditions of debris flows, while they differed in the expression of the concentration, channel angle, and sediment amount. The comparison was performed using a straight channel with various channel angles and a channel with a periodically undulating surface. The three entrainment rate equations gave different amounts of channel bed degradation and hydrographs for a straight channel with a channel angle greater than 21° when water was supplied from upstream at a steady rate. The difference was caused by the expression of the entrainment rate equations. For channels with little undulation, the numerical simulations gave results almost identical to those for straight channels with the same channel angle. However, for channels with large undulations, the hydrographs differed from those for straight channels with the same channel angle when the channel angle was less than 21°. Rapid erosion occurred and the hydrograph showed a significant peak, especially in cases using the entrainment equation expressed by channel angle. This was caused by the effects of the steep undulating sections, since the effect increased with the magnitude of the undulation, suggesting that a debris flow in an upstream area develops differently according to the topographic conditions. These results also inferred that numerical simulations of debris flow can differ depending on the spatial resolution of the simulation domain, as the resolution determines the reproducibility of the undulations.